Photos by Brian Blalock from the SHSU Flickr page. 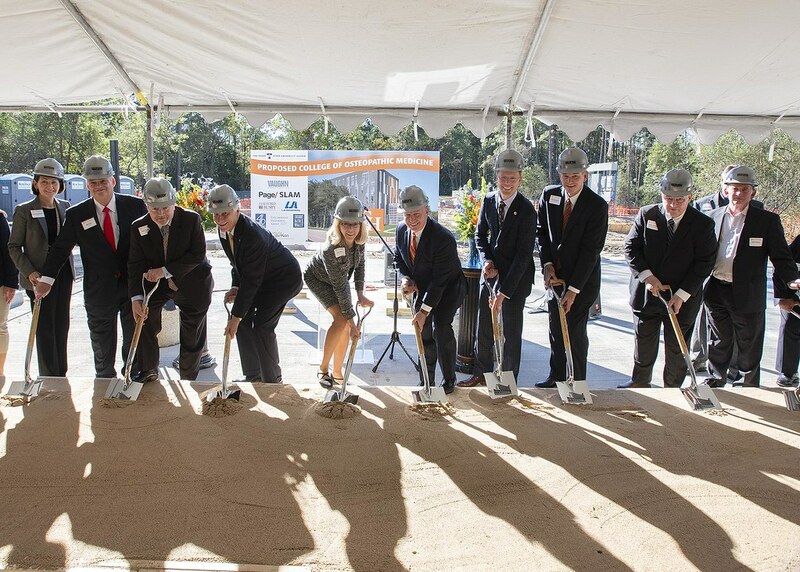 After years of researching, analyzing and planning, Sam Houston State University sent the first set of shovels into the dirt at the groundbreaking ceremony for the proposed College of Osteopathic Medicine (applicant status – seeking accreditation) on Friday, Nov. 16. Those in attendance included members of the Board of Regents, University President Dana Hoyt, administrators of the proposed College of Osteopathic Medicine, U.S. Rep. Kevin Brady and many others who have contributed in making the benchmark event possible. Construction now begins on the 108,000 square foot building that sits on a 7.3-acre property on I-45 just south of Loop 336 in the Johnson Development Corporation master-planned community of Grand Central Park. Above is the Sam Houston State University Vimeo video from the groundbreaking event. Hear from Congressman Kevin Brady and SHSU President Dana Hoyt. Video by Mike Foster. Brian McCall, chancellor of the Texas State University System, has supported the university’s tireless efforts in the development of a medical school, including testifying in front of the Texas Higher Education Coordinating Board, where he expressed enthusiasm in seeing further progress on the system’s first medical school. While Texas’ 8th Congressional District includes many hospitals and health centers, U.S. Rep. Kevin Brady voiced his support for its first medical school. East Texans who feel the impact of this critical shortage have voiced their endorsement of the proposed college, as more than 20 state legislators and thousands of residents have expressed support for the university’s proposal. SHSU’s history of contributing to the well-being of the state started over 139 years ago, when the university was established to respond to the need for trained teachers. At the time, state leaders recognized that education was key to improving the quality of life and the subsequent prosperity of Texas. Today the university is responding to another critical workforce demand, where education, again, is key to elevating the quality of life for millions of Texans.